YouTube is not only a channel for enjoying numerous fantastic videos but also a good source to listen to the newest and popular songs. But, as for music on YouTube, it's music in a format that isn't ideal for listening to on portable devices such as smartphones or iPod. That doesn't mean you can't download it or change the format, however. Any Video Converter Freeware is such a free YouTube Music Downloader, with which you can download music or playlists from YouTube and also convert these songs downloaded from YouTube to other audio format such as MP3, AAC, M4A, FLAC, WAV, WMA, and etc. In following guide, we will show you how to download YouTube songs, music, audio to your Android, iPhone, iPod or PC for enjoyment. Step One: Go to YouTube site and search for the music you would like to download, then copy the URL from YouTube webpage. Click on the button and click "Download Music Files", then a dialog will pop up, just click icon, and paste the download link to it. You can continue to paste more YouTube music links as the previous steps. Step Two: Now you can press Start Download! button to start downloading songs. Tips: Or before downloading YouTube songs or videos, you can press Online Video Tab, then simply choose Manually Select under Select Format thus you can choose different output format such as M4A, 3GP, MP4, Webm, and etc. Click Output Profile, unfold Common Audio Formats from the drop-down list and choose a proper format such as mp3, ogg, aac, wav, m4a or wma to choose the output format you need, then press Convert button to convert YouTube music to mp3 or other formats. 1. How to Keep Apple Music Files Forever for Offline Enjoy? Do you want to enjoy Apple Music songs for offline enjoy after canceling the subscription? Or transfer the files to MP3 player, iPod, Walkman, PS4 etc to enjoy them without any limitation? Yes, of couse, but the DRM protection inserted to Apple Music files limit you to do these. 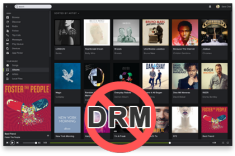 But here you can remove the DRM from Apple Music files with iTunes DRM Audio Converter and convert your Apple Music files, iTunes M4P files, iTunes Audiobook to plain MP3, AAC, WMA, and FLAC. 2.How to Save Spotify Music to MP3? Do you wanna save Spotify music to local computer or transfer it on your music player as plain MP3 files? But Spotify doesn't have this option for you, fortunately with Spotify Music Converter, you could make them come true. This Spotify Music Converter is well-designed to convert Spotify music to plain MP3 for listening on your music player or other portable devices.